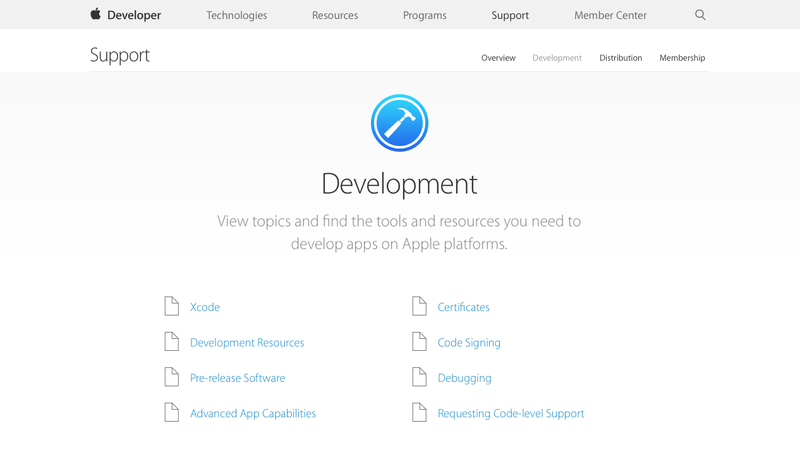 First off, make it easier to get to the Developer portal from Apple.com. Being a developer is just as much a product as an iPhone or an Watch; Apple needs to continue to sell that idea. Add a Developer tab at top of the homepage, right between the Support and Search buttons. Next, make an Education section in the Developer portal where all of the most important and relevant materials can live. Create a getting started page to orient noobs like me on where and how to begin. I think there used to be a tutorial like this where it walked you through making a list app. Third, in the Education section of the portal, provide links to any existing third party resources that Apple finds certifiable. Have you ever seen iTunes U? It’s amazing. There are so many resources there and they’re all free! Why are they not listed in the Developer portal? The Learn To Code section of the iTunes Store is full of great content. Why is it not mentioned on Apple’s website or dev portal? Fourth, make a course. Oh wait, they already did. It’s called CS-193-P, it’s at Stanford, and it’s free through iTunes U. So why is this course not advertised in the Developer portal? Because Apple assumes that if you are going to the portal you must already know how to program. For most visitors that might be true, but what about the young kid just starting out, or the adult that’s starting over? Where’s the welcome mat for them? Why is Apple not funneling people to these resources through avenues other than the iTunes Store? Do it. Tell people about the course. Then create a forum for people to get help and share ideas because not everyone can go to Stanford and interact with the teacher and the classmates. Fifth, create an official Apple online course. Make it cheap to free. Make the online support forum more robust and interactive. Sixth, create a certificate or degree. Why not? Google’s doing it. Check out Android Nanodegree. Six months, $200 per month, and you get a certificate. That’s awesome! Apple has already done an excellent job at providing a way for people to learn to develop for their platforms, but they need to take it a step further. Make the path and resources more clear and visible for those that are just starting out. Make it easier for us to find our way and to get the support that’s necessary for young flowers to bloom. Where are the words Education and Learn? Posted on June 13, 2015 June 16, 2015 by Garric G. Nahapetian	This entry was posted in Apple, Hopes For and tagged development, education. Bookmark the permalink.